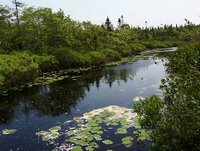 Last month life was peaceful at our stillwater as the waterlilies started to bloom. I've missed a lot of nice shots around home and the general area this summer due to rain, fog, and my illness which have all kept me inside for most of the time. When a good day does arrive everyone here is outside in the fresh air and sunshine as much as possible. A few pairs of socks have been knit though there were days that winding a bit of yarn was all I could manage. Hopefully those days are behind me. 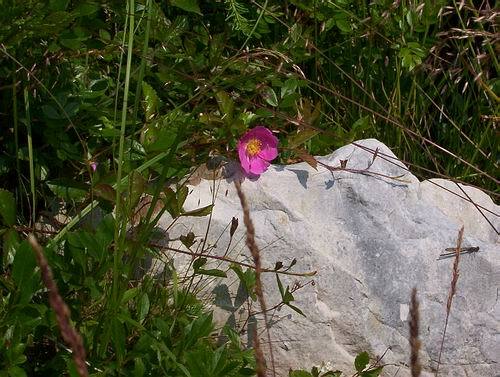 Lovely little wild rose growing over the rock. I honestly did not notice the dragonfly until the pics were downloaded on the computer. Have to brush up on my observation skills eh?! Glad to read that you're back on deck again,Dawn. Let's hope your health is on the improve. Oh my ...you have water lilies..wow. We don't have them growing naturally here. I clicked on your pics to enlarge them..and enjoyed them the more.